More command buttons, setting values across forms, sorted combo boxes, form/subforms, and more. 74 Minutes. This class follows Access 201, which we strongly recommend before taking this class. Access 201 covers all of the basic fundamentals and relational database concepts that are key for this course. 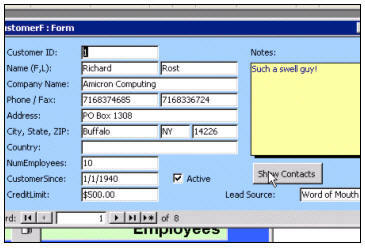 We'll begin by placing a command button on our customer form to show just the contacts for the current customer. This will allow us to see all of - say - Joe Smith's contacts. Next, we'll learn how to make the combo box on our contact form get its default value from the currently open customer record. This will teach us how to get a value from a different form using a new kind of naming notation. The benefit - we can create new contacts without having to fill in the customer value. We'll learn about the Tab Stop property - so we can make our Tab Order skip over the first few fields and go right to the Notes field when opened. ...and then manually changing the combo box Row Source property to get the values from the new query. The result? A sorted list. We will also teach you just a little bit of SQL (Structured Query Language) and show you how to modify the row source property without making a query to change that sort. We'll get into more SQL in future courses - we just wanted to give you a taste today. We'll learn about more combo box properties, such as the List Rows and List Width properties. Next, we'll enhance our contact management system by integrating a Callback feature into it. This way we can generate a listing of any customers we have to call back. We'll start by adding the necessary fields to our table and form. We'll create a Callback List Form which is a continuous form showing all of our callbacks - sorted by date. We can click on one of them and then click on a button to open up either the contact itself or the customer's record. In the following lesson, we'll learn about Subforms, which are forms that can go inside of other forms to show related data (like showing the customer's last couple of contacts right on the customer form). We'll start by designing a mini contact subform. Then, we'll use the Subform Control to place the subform inside of our main parent form. We'll teach you how to hide certain fields (like those ID numbers we don't need to see) with the Visible property. We will also see how to use the Phone Autodialer so we can just click on a button and have our computer dial the customer's phone number for us! We learn several key concepts in this course. Learning how to get values across multiple forms is a very important concept. Also, we will be building many more form/subform pairs in the future - especially when we get into our Order Entry System. Don't miss this course. Richard on 1/1/2007: More command buttons, setting values across forms, sorted combo boxes, form/subforms, and more. 74 Minutes. Richard Rost on 1/1/2007: ATTENTION ACCESS 2007 USERS: There is a BUG in the original version of Access which causes the command button to NOT work. See this post in my blog for details. 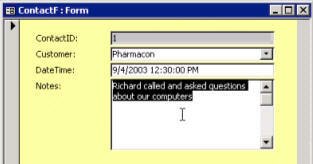 Richard on 1/2/2007: NOTE: If you add a new customer and IMMEDIATELY try to add a contact for him without first saving the customer record (moving off of it, or closing the customer form) you will find that the customer doesn't show up in the combo box on the contact form. This is because the customer record hasn't been saved to the table yet. You can fix this problem by creating a REFRESH button using the command button wizard: Form Operations > Refresh Form Data. You just have to click on this button before trying to make a contact. In my Access 300+ Advanced series when we get into programming, I'll teach you how you can add the refresh code (Me.Refresh) to the VBA of your OPEN CONTACTS button and do all of this in one step. Richard Rost on 11/21/2007: Access might want to install the subform wizard by prompting you to insert your Access CD, but you really don't the subform wizard. Just drop a subform on your form and set the Master and Child properties to link the subform to your main form. However, to answer your question, there is an Access Runtime edition available if you only need to USE an Access database (and not design with it). It depends on what version of Access you have. I'm trying to set a default value (a name)on a form which is taken from a combo box on another form. However, all I can get is the Unique ID, not the name. Remember the first column is column(0). We cover this in Access 302. Judith Koester on 4/18/2008: Where deo you get the full name of the box? It appears on the video that you click on Input Mask and Forms!CustomerF!CustomerID pops up. That doesn't happen for me. Richard Rost on 4/21/2008: Judith, I understand your confusion. This happens around time index 2:48. What you're seeing has nothing to do with the Input Mask field. That is a little screen tip that I placed in the video using my recording software. It just so happens that my cursor is blinking in the Input Mask property box. Instead of using NOTEPAD to illustrate the name, I just popped it on the screen using a "Screen Tip" from my video recording software. You just have to know the notation... Forms!FormName!FieldName. Now, you could use the Expression Builder to figure out the form name, but remembering the notation is just so much easier. Richard Rost on 4/21/2008: You're correct. The new video player does not have a Minimize button. I should probably add one, eh? Yes, you can still access your videos the old fashioned way. If you click on the "EXTERNAL" checkbox in the player, the videos will open up in Windows Media Player, and you can resize, minimize, move them as you see fit. Or, you can always load up Windows Explorer or open My Computer and run the videos manually by going to your C:\Program Files\599CD\ folder. I need to have a data entry form that allows me to type in an employee's name/SSN and populate fields from the EmployeeT but store the data in TrainingT. I have approx 15,000 employees so a drop down list isn't practical and I want to keep my tables clean. Richard Rost on 5/24/2008: Linda, the best thing to do would be to use a DLOOKUP statement then. This is a VBA function that requires a little bit of programming. It would allow you to type in the SSN, for example, and have everything else populated automagically. Now, I cover the DLOOKUP function in depth in my Access 302 class. There is also a free mini-video on DLOOKUP in the Tips and Tricks section if you want to check that out first. 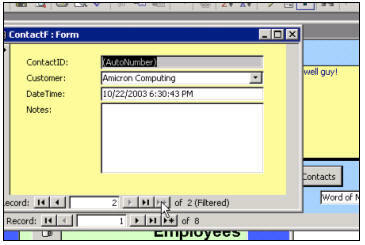 Anthony on 6/25/2008: I set up a form like you show in 202 that automatically displays a table of info that is related to the record that is open on another form (like your contact form in relation to the customer form). My question is, what if there is no related record (i.e. a record in ContactsT does not exist for the current customer). If a contact doesn't exist yet, I'd like it to begin a new contact record for that customer. Instead it seems to bug out a little and just show any customer's contact record. Richard Rost on 6/26/2008: Anthony, it shouldn't "bug out" at all. If you click on a customer who has no contact records, you should just see a blank form. 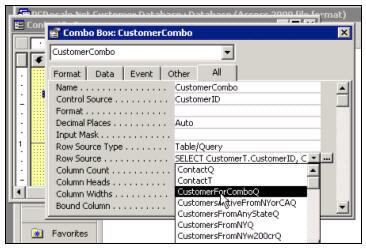 Isaac Moses on 6/29/2008: When you delete a combo box do you delete all information you entered or automatically entered like SQL for this combo box or does that information reside in the database as garbage data? Richard Rost on 7/1/2008: Isaac, when you delete a combo box, any SQL statement stored in the box's Control Source is deleted. Now, as with almost everything in computers, is that information REALLY deleted? Well, it's marked as DELETED, but as with files I'm sure a super-geek could resurrect it somehow. For the average user, however, it's gone. 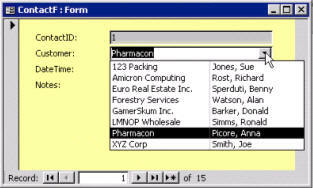 Tonya on 4/2/2009: Is it possible to disable the ability to add a record to the subform? Richard Rost on 4/2/2009: Tonya, you can set the AllowAdditions property of the subform to NO. ADP on 7/13/2009: I have a subform on a main form. The subform has a button to open an external form. I would like to have a value from the subform be the default in the external form. I can not make this happen using the Default Value as shown in this lesson. You can put this value in the Default Value property of your new form, OR it might be easier to go the other way. In the VBA code for the button that opens this new form, you might just want to set the value manually in the new form after opening it. If the button is IN the subform of which you speak, then you wouldn't need to use any crazy notation. I cover this when we get into the 300-level series of Access courses and start learning VBA. Richard Rost on 7/25/2009: Carolyn, I don't know of any way to change the default length of a new textbox when you add it to a form. Sorry! I'd love to know if you find it though. Richard Rost on 9/25/2009: David, it has that feature. Form Operations > Open Form. NEXT. Pick your form. NEXT. "Open the form and find specific data to display" on the next screen. Ghassan Baghdadi on 10/21/2009: Sir, I was trying so many times to open a form for a specific customer but it didn’t work with me. I don’t know what is the problem. I followed what you have said but nothing changed. So, what is your recommendation. Richard Rost on 10/21/2009: Ghassan, I would need to know exactly what you're doing so I could tell you why it's not working. Are you following the lesson EXACTLY as it appears in the video? Are you using MY database or your own database? What version of Access are you using? Give me a step-by-step on exactly what you're doing. I need more information in order to help you. 1-I was trying to make a contact button in the customer Form but it didn't work. Once I click on the button, filtration doesn't work. 2-Yes I am following what you are saying exactly in the lesson. 3-I am not using your database because I don't have it. I searched for it but I think it didn't download when I downloaded the lessons. 4-I am using Access 2007. Is there any difference between what you are using and 2007? -I have opened my Employee Form in Design View and make a button (Form Operation > Open Form > EmployeeF> Pick Open the form and find a specific data to display> ID <> ID and then Finish. Save and open the form, click on the button I did, but didn't work. -Also, Sometimes, I got empty table in the Matching Field in the Left Hand Side. I dont Know Why? That What I was doing and Thank you for your great teaching. Richard Rost on 10/24/2009: Ghassan, it turns out that this is a bug in Access. I just posted about it in my blog here. Judith Koester on 12/16/2009: I am trying to make a combo box with state abbreviations. I get a message that "no more than selected". I created a table with the 50 state abbreviations. That just doesn't sound right to me. Is this an evil thing of 2007?, or what am I doing wrong? Seems pretty straight forward to me. Judith Koester on 12/16/2009: After trying the state abbreviations combo box about 20 times and asking for your help, I ditched the table and re-did it. My combo is working OK now. Sorry, but am not sure what was going on. Richard Rost on 12/20/2009: Glad you got it working. That's always my 2nd rule of thumb: delete the object and re-create it. The 1st rule is to reboot your PC. If that doesn't work, recreate it. Chris on 3/12/2010: I noticed in Access 201 that you corrupted one of your contact records (ContactID = 1). I also see this carrying through to this lesson (see 8:25). Is this purposeful - i.e. a future lesson we'll see data integrity issues come-up? You know, I honestly don't remember. :) This lesson is already over seven years old, and I can't recall if I used that for other nefarious purposes in later videos or not. Anyone else recall? Sam on 6/2/2010: In your video the full address just pops up by itself once you selected the name of the field "!Form!Customer!CustID". I can't get the full address to pop up. Judith Koester on 7/21/2010: Trouble again. I just noticed when I use the drop down box for state -- California for instance, instead of CA my query says 5. ??? I'm sure it's something simple, but I'm stumped. You probably didn't HIDE your KEY COLUMN. Remember the very first column in the box has the ID in it. The wizard gives you an option to hide it, which essentially makes the column's width equal to zero. Dale Sams on 9/19/2010: Is there anyway to zoom the page in the design view? It might be easier to align & size the various elements if you could get a little closer. Nope. Sorry. I wish you could. 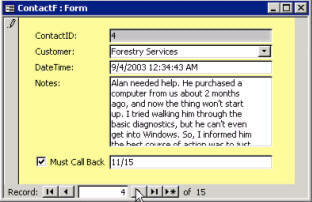 PA on 9/30/2010: In the minute 3:02 you get in a pop up the complete / full true name for a text box in a form (Example: Forms!CustomerF!CustomerID). My question is, how do you make visible that full name in that pop-up on the screen? Try closing the form and reopening it. Sometimes that's what you have to do to see the true saved dimensions of a form. Just switching from design view back to form view doesn't cut it. A. David P on 10/28/2010: I have Access corses up through 329 which I have been working my way through. If you have a table that contains a persons work history for example, from say Associate, Senior Associate, Jr. VP, Sr. VP, President with dates in each position. Is there a course that covers how to make the latest position the "active" position? Thanks, Dave. Great courses BTW, I've never seen better. I'm assuming you have a start date for each position? Just use the DMAX function to find the largest start date, then DLOOKUP the ID from that record for that employee. That will tell you what their current position is. Or... even easier, just make an IsActive field in that position table and have the user check the current position ON. I'm sorry, I don't understand what the problem is. Can you be a little more specific, please? The purpose of the default value is to set the name to the currently open customer when you add NEW CONTACTS. Lesson one covers making a button on your customer form to click and open the contacts for the currently selected customer. I am in Access 202 Lesson 2: "Set Values Across Froms". The time is 2 minutes and 42 seconds. You are discussing the "full name" of the control source. A pop up box on the screen show the full name as Forms!CustomerF!CustomerID! but there is no explanation of how you produced the pop up box. Could you please tell me how this is done. <-> button, there is nothing in the left form (in this case, my student form). I have info in there, but where is it now? Judith, I don't understand the problem. Can you elaborate a little more please? Judith Koester on 5/3/2011: I downloaded SP2 and still have the same problem trying to add the button -- no information on the first form listed to link to the second form. I have Windows 7. Is there something new re that? Judith Koester on 5/4/2011: I am trying to create a button to link 2 forms (student form and finance form). After I select "open the form and find specific data to display", there are no fields on the left form (studentF) to link to the right form (financeF). I am using Access 2007. OK. When you open both forms individually, do you see data in them? Make sure you have the forms properly built, and bound to their tables. What is the FIELD that links these tables together? StudentID? Judith Koester on 5/4/2011: Both forms have the data in them. I have StudentID as the foreign key in Finances and the forms are linked. Then you should be able to create a button using the command button wizard that will allow you to "open a form and find specific records to display" linked on that StudentID. I'd have to see your database to tell you exactly what's wrong. If you'd like, send it to me at richard.rost@amicron.com. Judith Koester on 5/4/2011: Okay, this is weird. I decided to try the flip and create the button in the FinanceF to StudentF. All the info appears! and the button works. That's very strange. I've only seen this happen if you have a form where the form itself or the underlying query relies on the data from the other form existing... like if you refer to Forms!StudentF!StudentID from INSIDE of your FinanceF or its query... which you shouldn't know how to do yet if you're only on Access 202. Fabian Sanchez on 5/4/2011: Richard I'm trying to create a report log that will grey out the entries once the date, starttime and endtime is past. i.e. startdate = 4 May 11 and starttime is 10:30 endtime 11:00 once the system clock goes over 11:00 I want that entry on my report to be greyed out. what's the best way to implement this? When I add a header and footer (with my Labels in the header and command button in the footer) I don't see them when I run or preview the form. And the header labels are set to "visible" yes. Wendell Satterwhite on 1/31/2012: If you made an entry form how could you set a field to default to the previous record field entry in the event occasionally that field would be a duplication for several records. "Richard Rost on 2/28/2008: If you just read the value of the combo box, you're getting column zero which is PROBABLY your ID field. If you need to get the name out of the second column, access it like this =ComboBoxName.Column(1) Remember the first column is column(0). We cover this in Access 302." Exactly what I wanted to know too ! Now when I enter a Town, the Area box is automatically recorded from my TownAreaT. Vannak Hou on 12/16/2012: Time Index between 14:35 and 14:55; can you just bring in the CompanyName and the FullName without the CustomerID field or is that required? I'm saying to eliminate the hidden process of CustomerID. So this in case, we would have two fields (CompanyName and FullName). You could, but then you wouldn't be able to store the ID value or use it anywhere... which almost makes it useless. You want the CustomerID so you know which customer the Contact belongs to. Vannak Hou on 12/17/2012: How were you able to show the Forms!CustomerF!Customer!D on the property? My Access 2010 doesn't show that at all. What is the time index in the lesson? 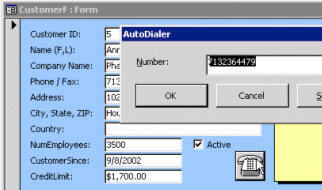 Vannak Hou on 12/19/2012: How did you have Access 2003 show Forms!CustomerF!CustomerID! on the "All" tab? Time 02:45-02:50. I'm using 2010. That's just some POPUP TEXT that I was able to put in the video using my recording software. It's not part of Access. You can use the Expression Builder to get that name, but I wanted to show you how to do it manually. I'll be covering the Expression Builder in more detail in an upcoming class. Vannak Hou on 12/20/2012: Here is the actual SQL= to the "CustomerForComboQ"
Make sure to change the Column Count=3 NOT 4. Yes, you could use VBA to do this... or even more easily just use CONDITIONAL FORMATTING. Vannak Hou on 12/22/2012: Time Index: 10:00. I guess it takes some practice to do the for customization or aesthetic look,huh. It has taken around 45 minutes so far. Before it took me at least 1.5 hours to do. It's getting better each time. Vannak on 12/22/2012: I have been reviewing(watching) the videos in the 201 and 202 for over 12 times already because there are things that I can't do not understand but I am being patience as much as possible because each time I watch over and over I remember things; things are making more sense. Thanks Richard! vannak on 12/22/2012: Yep, I noticed that too. Thanks again. I have been playing around with the property quiet a bit and see some differences when I changed from this and that. Vannak on 12/22/2012: Wow.. awesome! I like the links. Checked already! Vannak H on 12/22/2012: Yeah, the way you do it, looks easy but when I get my hands on a couple of weeks ago, it took me forever to do design the forms and the reports. I'm getting better than before. vannak on 12/23/2012: Hey, I think I did that one time and got into a problem then I was able to resolve. Design View on ContactF, double Click on CustomerID Textbox (right side) not the Label box, Go down (way down) to Default Value and this in again =[Forms]![CustomerF]![CustomerID]. Save, Close It, and retry. Vannak Hou on 12/28/2012: Question: I have the Excel file which has the full name in one column; for example, Vannak Hou instead of in First=Vannak Last=Hou in two different column. So how do I import that file into Access 2010's field of First and Last name? Instead of "manually" typing all the 100 rows to Access file. There are a couple of ways you can do this. In Excel, you can select the column, go to DATA > TEXT TO COLUMNS > DELIMITED > Space Character. That will generally work for MOST of your names, assuming they all have just ONE space in there... and don't include middle names, middle initials, compound names (like Martin Van Buren). Then just import THAT into Access. I cover this in Excel Expert 1 in more detail. There are other techniques that you can use to separate names if things are more complex. See THIS and THIS. Svend Christensen on 1/9/2013: Hi Rich. I am using Access 2007 for my 2003 Access course. Everything has been working well upto now. However I have encountered problems with the properties for formfooters. I am missing the opportunity to make headers and footers visible in form view, but it looks fine in design view. 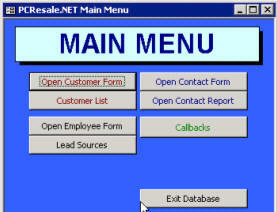 It means that the buttons Open Customer and Open Contact are invisible in Form View. I have then downloaded your lesson 202 with extension .mdb saved and converted it Access 2007 with extension .accdb. The Formfooter properties consist 19 rows in this version and my installed 2007 Access does it only consist of 10 rows. I can turn form headers and footer off and on in the converted version. The opportunity to set headers and to footers to always visible is simply missing in my Access properties. Yes, you should be able to see form headers and footers. Right-click on the DETAIL section bar and you'll see the option there. If you're using the sample database downloads from the web site, many times you'll find that it's BETTER to start with a blank 2007 database shell and IMPORT the objects from my 2003 databases. Svend C on 1/10/2013: Hi Rich. It is in fact my own 2007 database I have buildt doing the course. I don't understand the problem. Can you email me a screen shot of what you're talking about? Send it to amicron@gmail.com with an explanation. Some things are just easier to help you with if I can SEE them. James Miller on 1/26/2013: Hi Richard. I cannot see the right side of the form. My field labels for Must Call Back and Customer ID will not go up into the form header. And I never see your right side after you bring up the labels to the header. Did you just delete the other fields? Deisy Enriquez on 4/30/2013: What if you wanted the subform to display the information for a single date. 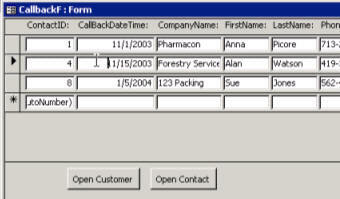 For example, if for whatever reason most customers had multiple daily contacts and you wanted to display all the contacts that happened on any given date? You could use a PARAMETER QUERY to ask the user for a date value, or you could get it from a FORM FIELD. john Edwards on 3/5/2014: Hi Richard Magic stuff. I am at 3.25 on the Access 202, video 2. You don't show how to open up the Forms!CustomerF!CustomerID. It just appears. Can you tell me how to do it please. Nicholas S on 4/4/2015: Hi, I noticed this is where a Dial button is added to get the auto dialler to call the customer, this of course uses the old style modem cards installed in you PC. Is it possible to somehow get this to work in Access 2013 using a IP telephone / VoIP? John Mason on 12/25/2015: Richard,I have a combo box that links to a table by the ID field. I would like to pull the values from other fields. Which course or courses do I need to study to learn how to do this?. I am currently using Access 16. Sounds like the job for DLOOKUP.